Burmese Buddhism is largely of the Theravada sect. Theravada means “Way of the Elders,» an implication that it is literally what Buddha taught. Theravada Buddhists resist the idea of Bodhisattvas and regard their system of beliefs as being purer and close to what The Buddha taught. About 90% of the Myanmar practices Buddhism. Adherents are most likely found among the dominant ethnic Bamar (or Burmese), the Shan, the Rakhine, and Chinese who are well-rooted in Burmese society. Among ethnic Bamar, Theravada Buddhism is practiced in conjunction to nat worship. Monks, collectively known as the sangha are important members of Burmese society. The Sasana Vamsa summarizes much of the history of Buddhism in Myanmar. 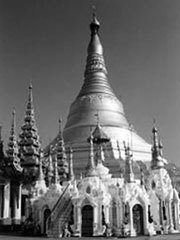 Buddhist history in Myanmar is related to Pagoda in Burma/Myanmar. Myanmar is often called the «Land of Pagodas». Shwedagon Pagoda is steeped in the religious faith of the people who have worshipped there for generations. The culture of Myanmar is related to Buddhism. There are 12 numbers of Burmese festivals all are related to Buddhism. The Burmese New Year, Thingyan, is a also known as the water festival. It is also a time when many Burmese boys celebrate shinbyu it is a Buddhist boy enters the monastery for a short time as a novice monk. All Burmese parents duty to make their sons are admitted to the Buddhist religion by shinbyu.